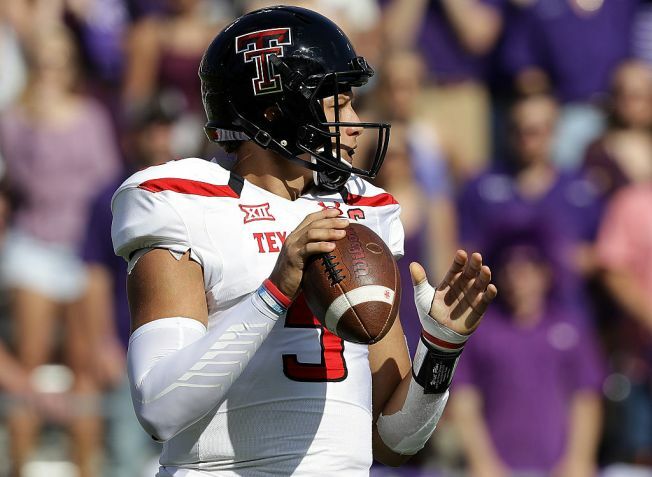 Former Texas Tech quarterback Pat Mahomes will be watched by 49ers GM John Lynch at the Texas Tech pro day on Friday. At Texas Tech, Pat Mahomes put up huge numbers as the quarterback of the team’s wide-open spread offense. In 2016, he led the FBS division of college football by throwing for 5,052 yards, an average of 421 per game, while completing 65.7 percent of his passes for 41 touchdowns against just 10 interceptions. And, at 6-foot-2 and 225 pounds, the son of a former major league pitcher (also named Pat Mahomes) is big and fast enough to run the ball, too. Yet Mahomes hasn’t been considered among the top three quarterbacks in the draft, consistently ranking behind Deshaun Watson of Clemson, Mitch Trubisky of North Carolina and DeShone Kizer of Notre Dame. Yet Mahomes – whose stock has risen since testing for NFL teams at the NFL Combine – could be a second-round target of the 49ers, who will get to select the 34th (after using the No. 2 choice in the first round). Reports indicate Niners general manager John Lynch will be at Mahomes’ Pro Day workout Friday morning. It’s possible the 49ers could take the best player available with their first-round choice (a non-quarterback) and then address their long-term QB situation by selecting Mahomes – or another prospect – in Round 2. Mahomes certainly has been getting solid reviews. This week, the NFL Network’s Mike Mayock praised Mahomes for his “big arm” and scrambling ability. But, Zierlein notes he’s a confident quarterback with a variety of strong skills, including his ability to free lance. David Fucillo of SB Nation noted Mahomes could be in a group of QB prospects – along with Davis Webb of Cal and Nate Peterman of Pittsburgh – whom the 49ers could select in the second round if Lynch and Shanahan believe they’ll receive good value for the future.